Is there something in the water, or the air? Yesterday the Manolo, he recommended a lovely cowboy boot to a loyal reader, and had the very nice things to say about the cowboy boot. For the past decade I’ve been threatening to buy a pair, ever since the first time I went to Montana. Being a poor assistant professor, and then saving to buy a condo, and then saving to buy and renovate a house, has always provided a ready excuse. But NO MORE! Just last week my new pair of Tony Lama black Ol’ Buck boots arrived (bought on sale for 40% off at Sierra Trading Post). Evern since I returned from England on Tuesday they have not been off my feet, except for during sleep and shower. I am amazed at how assured and authoritative they make me feel, in addition to being much more comfortable than I expected. I guess if the Manolo and I, we are on the same wavelength, then I am riding a fashion wave. Actually, there were lots of knock-off cowboy boots in the shops in London, to accompany the tiered skirts and other boho themes that are in fashion this spring. OXFAM LOOKING TO REDUCE PRODUCTIVITY OR TRANSFER WEALTH? LET ME REITERATE: COMMENTS AND TRACKBACK NOT WORKING FOR NOW! So, your choice of the boots, they have the Manolo Stamp of the Approval as the super fantastic. P.S. And, of the course, you yourself are indeed super fantastic! Mille grazie, Manolo! I shared a table at the Green Mill the other night with a woman wearing these boots; I was wearing mine, and we compared notes. We agreed that they made us feel super fantastic! Tried to give you some advice about the boots but your comments were still not working. This advice is to stop with the boots and go no further. The cowgirl look is great and line dancing is fun but no one with any economics cahonies(sp?) should buy a horse. 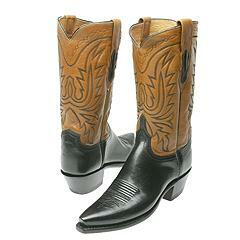 We have them and have a great time on them, without the boots BTW, but they are expensive and fragile. No worries on that front! My mother used to have a horse, and I have no interest in that. I just want the boots! And I’m finding that the heel height and shape are good for the plantar fascitiis in my foot.